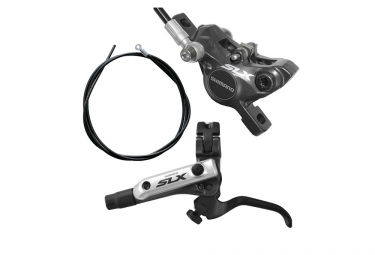 The new SLX SERVO-WAVE hydraulic disc brake provide huge progress in braking, control and heat management. The new compact caliper with oversized one-way bleeding 22mm ceramic pistons is combined with a lightweight lever. SHIMANO Frein Avant SLX M675 Gris clasificado 3.5 de 5 por 6.